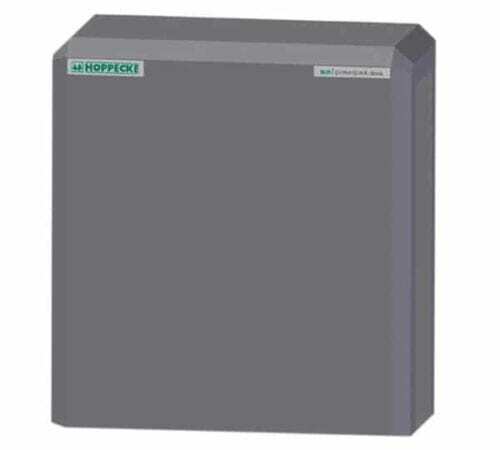 Be independent with Hoppecke Sun Powerpack Classic 11 kW 48 V Solar Battery! Everyone is talking about self-produced energy. The price for self-produced photovoltaic energy which is fed into the power network is dropping rapidly. At the same time, the energy price of the electricity suppliers is constantly increasing. For many private households and businesses, these are two important reasons to use their own solar energy directly. However, the generation and consumption of photovoltaic energy are not synchronised. Battery systems allows you to store the photovoltaic energy so you can use the generated energy independent of the sunlight. HOPPECKE offers you an energy storage solution, enabling you to manage the demand of your household and therefore to reduce electricity costs. With our solar.power pack, you are able to store your solar energy temporarily in order to use it at specified times. Even in the event of a power failure, you are on the safe side. The battery system immediately provides you with the required energy. If you use the set for Sunny Island 3.0 you have to change the Batfuse to 80 A. If you use the set for Sunny Island 4.4 you have to change the Batfuse to 100 A.
HOPPECKE offers you an energy storage solution, enabling you to manage the demand of your household and therefore to reduce electricity costs. With the company`solar.power pack, you are able to store your solar energy temporarily in order to use it at specified times. Even in the event of a power failure, you are on the safe side. The battery system immediately provides you with the required energy. Join our ZERO Home Bills Community. BEST Products from the BEST Brands at BEST Prices for ZERO Home Bills on ZEROhomebills.com by Solaranna.